Back in the April issue of Tropical Fish Hobbyist magazine, a photo was displayed claiming to be that of Danio margaritatus, the Celestial Pearl Danio. Having raised literally hundreds of these fish it struck me that this was not actually a photo of Danio margaritatus. I even went so far as to post on the TFH forum about my concerns. Well it seems as this photo has made it’s way to our European fish keeping friends and a lively discussion has taken off on the Seriously Fish forum. My hat is off to Johnny Jensen for realizing that this fish is not Danio margaritatus and now having 2 different pages of photos. 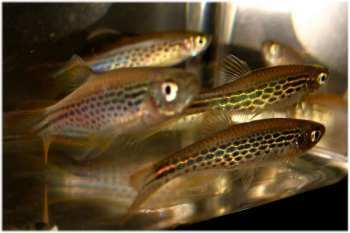 The true Celestial Pearl Danio photos are at this page, and the new fish now has it’s own page here.